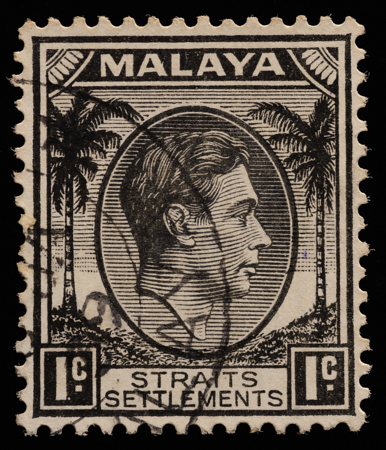 The stamps were letterpress-printed, usually in sheets of 100, in London from electrotyped copies of the original engraved and hardened steel dies. Letterpress is the oldest method of making many prints from a single original. It is thought to have been invented by makers of playing cards, who engraved their designs on blocks of wood (Blum 1940). During the time of the coconut definitive, De La Rue printed their letterpress stamps on a Wharfedale press. See Yendall (2008) for technical details of this specialized stamp-printing equipment. First the key plate (vignette) in the centre was printed, followed by the duty plate with the surrounding design. This is curious since the key plate is intuitively a foreground object. 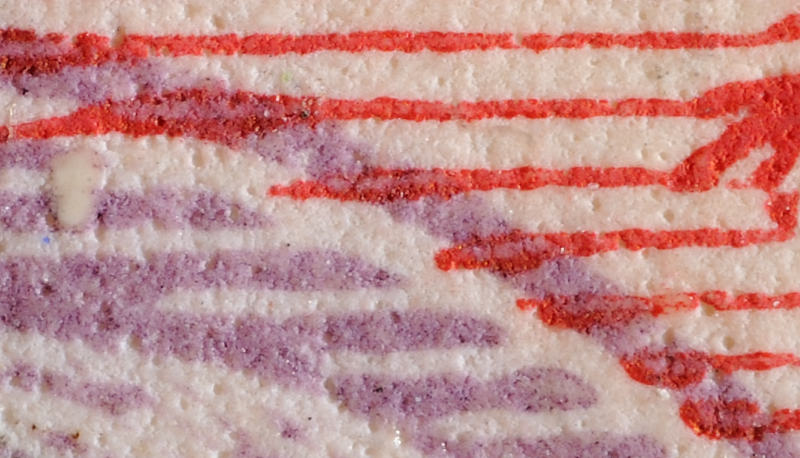 This close-up shows the displacement of ink where the duty plate (red) overlays the key plate (purple). 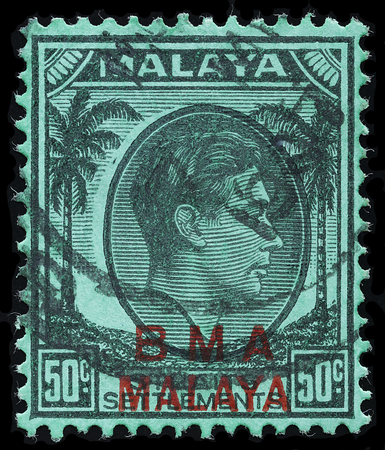 This phenomenon varies from stamp to stamp, possibly depending on the properties of the ink and the time the medallion has been allowed to dry before applying the duty plate. It also shows a characteristic of letterpress printing: the thicker ink along the boundaries of the impression, caused by excess ink deposited in the grooves of the plate during inking and by printing pressure squeezing ink out from the printed areas (Williams & Williams 1969). Printing from interlocking plates is thought to have been invented in the early 19th century on the Strand in London. It was first used on stamps by De La Rue in 1863. This made it easier to print bicoloured stamps (Lowe 1979a), update the monarch and mix and match plates. The use of a single key plate for all denominations also saved raw materials and labour. These printing plates like all others were prone to accidental damage, producing plate flaws (see Hale 1991, Tyre & Stanway 1991, Glover 1994). The key plates were sometimes misaligned—here shown too high and too low—despite the fundamental importance of accurate registration (alignment) in security printing (Fernbank 2013) and the valiant efforts of De La Rue to overcome this 'enormous difficulty' since the earliest days (Easton 1949). One of the worst cases of misregistration encountered by the author. 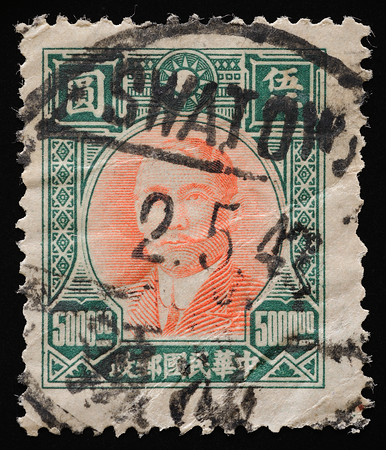 One trait of this 1946 Chinese Civil War-era Sun Yat-sen issue may be considered superior to the Die I coconut definitives: the elliptical frame around the portrait is engraved on the duty plate rather than the key plate in the Chinese stamp, which guarantees perfect centering of the ellipse with respect to the duty plate. Had Die I of the coconut definitive been designed this way, mis-registrations of the plates would have been less obvious. Many of the engravings of the British monarchs, however, had already been made incorporating the elliptical frame prior to the advent of the coconut definitive; the designers were hence likely to have been bound by historical, logistical and physical constraints. Just before issue, a serious error occurred in the dollar denominations, where the dollar sign was placed after the numeral e.g. '1$'. 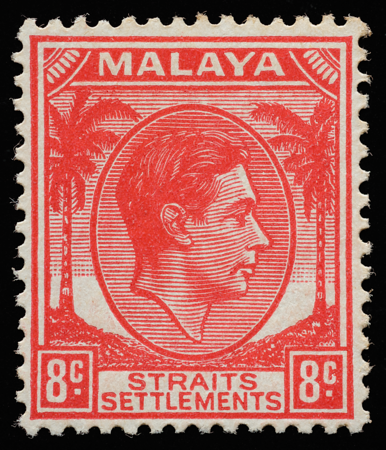 Proofs exist in the Crown Agents Philatelic and Security Printing Archive and in private collections (Singapore Stamp Club 2000, Spink auctions 16 August 2015 and 28 October 2017). 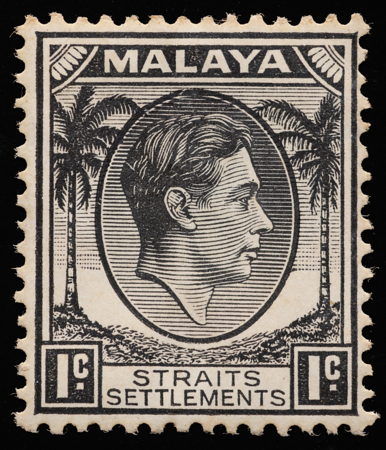 The error was said to have been spotted on the finished stamps by a Chinese clerk in Singapore, causing a reprinting to be ordered and the misprinted stamps destroyed (Wood 1948, Barker 1977). The coconut definitive was finally born to the outside world on New Year’s Day 1936. It went to the post offices in sheets of 100 (10 by 10), which had a backing of gum arabic. Some highly used monochromatic denominations were subsequently printed using a single die referred to as Die II (Skinner & Peters 1988), such as this unissued 8 cents whose colour became invalid after changes in Universal Postal Union postage rates. 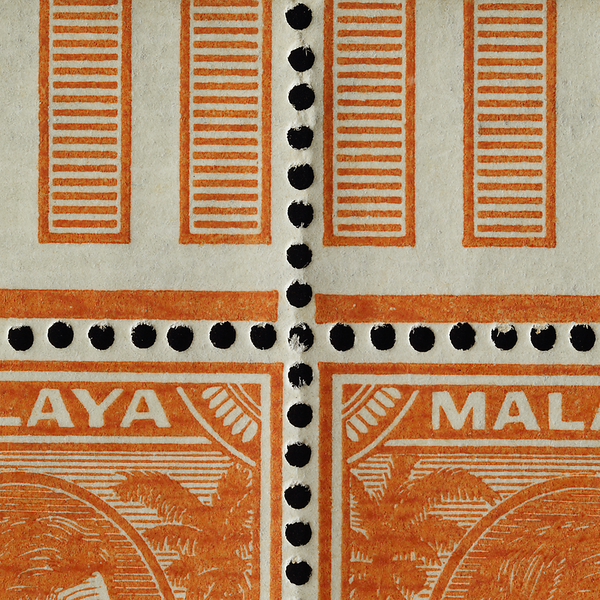 The single-die printing method, often used on sheets of 200 stamps, was more cost-effective for large production runs (Easton 1949); the medallion and its surrounding artwork now do not overlap. Notice that the medallion in Die II is set nearer to the ground than in Die I. The die was soon discovered by philatelists to considerable fanfare (Rang 1939). The coconut definitive thus came to embrace both key-plate and key-type technology. Sometimes seen at the top or bottom of a pane of 100 stamps are the so-called "bars", "pillars" or "space fillers", which occupy the gutter between panes in a 200-set or 400-set plate used for some Die II issues (Rosevear 1983, Cockburn 2016a). The purpose of these bars could have been of preventing the ink roller from damaging the edges of the stamp design (Williams 1990), or reducing ink wastage or plate fouling by preventing ink from smearing the entire gutter as it was applied across the plate. Sometime after the war, the panes were separated for further use and the bars removed (Cockburn 2016a).